India's pace spearhead Zaheer Khan considers the two years with Greg Chappell as national coach the worst of his decade-long career. He says the controversial Australian made him feel unwanted in the team. Zaheer said he and other senior players were constantly worried about their places in the side and unable to perform during that tumultuous period between 2005 and 2007. "It was as if you've been framed. It was like 'we don't want you in the team. It's not about performance, we don't like your attitude, you're stopping the growth of cricket in the Indian team'. "I felt it personally, because I was dropped straight after the Sri Lanka tour, even though I had not performed badly," Zaheer said. "I was fortunate enough to go to South Africa to represent the Asia XI (in the Afro-Asia Cup). I got about nine wickets and I was recalled for the next series. "In that phase it was always a struggle. When you're fighting within the team, when you have a war to fight in your own camp, it is always difficult to win," he said. Chappell took over as India coach in May 2005, but his tenure was marred by serious differences between him and senior players, including Sachin Tendulkar. He also had a public spat with the then captain, Sourav Ganguly, who was dropped from the team but later recalled. At the end of his tenure, following India's first round exit from the 2007 World Cup, Chappell decided not to seek an extension of his contract. Zaheer said, in contrast, former South Africa batsman Gary Kirsten's tenure as India coach was "amazing". "He has given everyone their space. He's understood the Indian culture and how we do things. He's taken that step of coming closer to us rather than dictating. He was our friend, not a coach," Zaheer said on NDTV's Walk the Talk show. Kirsten took over in tumultuous circumstances but left the job on a high, guiding the Indian team to a historic World Cup triumph after a hiatus of 28 years, besides taking them to the pinnacle of the Test rankings. Zaheer said the only positive of Chappell's tenure was the inclusion of youngsters in the team, but felt that sacrificing experienced players was not the only way to give opportunities to youth. "A youngster coming in is a good sign, but not at the cost of a cricketer who is doing his bit." The 32-year-old Baroda pacer said the county stint with Worcestershire came at the right moment for him when things were not going his way. 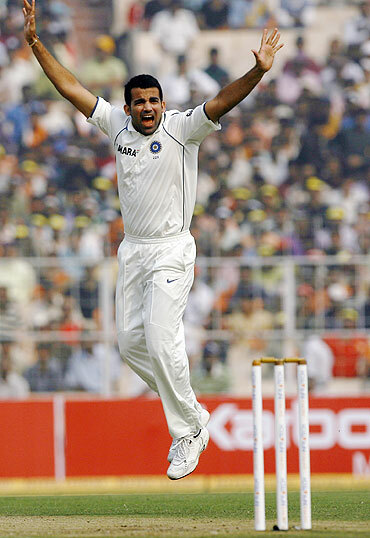 Zaheer signed up with Worcestershire for the 2006 county season and finished as the highest wicket-taker in Division Two of the County Championship, taking 78 wickets at 29.07. "Worcester taught me the reason I'm playing this game. Sometimes when you play at the highest level, especially in India, the whole country is so passionate about the game; so whether you do well or do badly, it affects you in many ways. So when I went to Worcester, it was just me playing cricket." "I was just enjoying cricket and not thinking about other pressures, about the pressure of performance. Everything was falling into place. I was taking wickets. Even though I was not in the Indian side, I was actually happy," Zaheer said. Talking about the historic triumph in the World Cup, in which he was the joint-highest wicket-taker with Shahid Afridi, with 21 wickets, Zaheer said he is now a calm and composed player as compared to the emotionally-driven youngster in the 2003 final against Australia. In the 2011 World Cup final he bowled three consecutive maidens at the start of the innings. "I was only a couple of years into international cricket; the World Cup journey itself was something special in 2003. That time my thing was to bowl quick. I wanted to be aggressive." "It was a World Cup final; there were a lot of emotions. As soon as the national anthem finished there was this rush of young blood. I wanted to do really well, wanted to just blast the Australians apart," he said. "This World Cup I was aware of the fact that there will be a lot of emotions I have to deal with. I have to maintain my calm and focus on the process. I was telling myself just go there and bowl," he added.